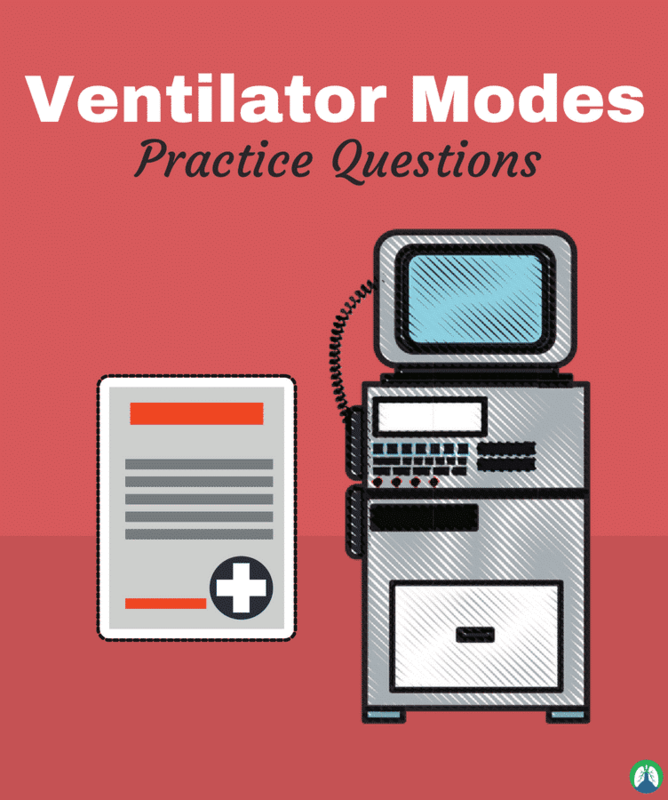 This post is loaded with Ventilator Modes practice questions to help Respiratory Therapy students learn Mechanical Ventilation. So if that’s you, and you’re looking for Ventilator Modes practice questions, then you’ve come to the right place. That is because below, we compiled a massive list of practice questions and terms that (if you study them, of course) will give you an excellent understanding of all the different modes of mechanical ventilation. This information is very important and is something every Respiratory Therapy student needs to know for school, boards, and for when they begin to see patients on their own. So let’s get started, shall we? 1. What are 5 examples of positive pressure ventilators? 2. What type of pressure ventilation involves normal respirations, chest cuirass, and an iron lung? 3. Positive pressure ventilators can be ____ vs ____ controlled. 4. What are 2 types of nonconventional ventilation? 5. How does PPV create transairway pressure? 7. What is an advantage of volume controlled mode? It ensures minimal minute ventilation. 8. What are some disadvantages of volume controlled modes? The pressure is variable, possible barotrauma/volutrauma, volume is limited by the high pressure alarm. 9. What is an advantage of pressure limited modes? There is less risk of barotrauma. 10. What are some disadvantages of pressure controlled modes? It doesn’t ensure minute ventilation; The tidal volume is variable. 11. What two things are variable on pressure controlled ventilation? Volume (dependent on a set pressure) and Flow. 12. What are the four types of triggers? 13. What is the control used to adjust the ventilator sensory of the patient’s inspiratory effort called? 14. What are the two types of sensitivity controls? 15. How does a pressure trigger work? The ventilator senses a drop in pressure below the baseline and senses the patient’s negative inspiratory effort. 16. Which trigger type is more sensitive, pressure or flow? 17. How does a flow trigger work? When a patient initiates a breath, base flow returning to the ventilator is reduced, thus triggering an inspiration. 18. What is Controlled Mandatory Ventilation? A mode that is time-triggered, machine breath, and volume or pressure cycled. 19. What are the indications for CMV? The need to control minute ventilation completely. Also, the need to control chest expansion completely, for example, with a patient with flail chest. 20. What are some complications of CMV? The patient is totally ventilator dependent, alarms are essential, you may be unable to assess weaning, and seizures may interrupt the delivery of a breath. 21. What are some indications for A/C mode? The patient needs full ventilatory support, the need to support a high minute ventilation with low oxygen consumption, the need for sedation after intubation. 22. What are some advantages of A/C mode? Decreased work of breathing. The patient controls the respiratory rate, therefore the minute ventilation. 23. What are some complications of A/C mode? Hyperventilation (i.e., respiratory alkalosis), pain/anxiety/CNS disease, Biots or Cheyne-stokes respirations. It was the first widely used mode that allowed partial ventilatory support, facilitates weaning, increase muscle strength. It is not widely used today. 25. What are some complications of IMV? Breath stacking, which is a spontaneous effort immediately followed by a mechanical breath, which leads to an increased PIP; barotrauma; and cardiac compromise. A lung injury that occurs from hyperinflation of the alveoli past the rupture point. It usually occurs at a PIP > 50 and a Pplat > 35. 27. What is the synchronization window? It is the time interval just prior to time triggering in which the ventilator is responsive to the patient’s spontaneous breath. 28. What are some indications for SIMV? If the patient needs partial ventilatory support, and if the patient can actively contribute to their minute ventilation. 29. If the set rate is high (8-12) in SIMV mode? 30. Setting the rate low (<8) in SIMV does what? It facilitates weaning, strengthens respiratory muscles, decreases mean airway pressure making spontaneous breaths have a lower peak pressure than mandatory. 31. What are some complications of SIMV? A low rate can increase the patient’s work of breathing causing muscle fatigue/failure. 32. What mode has a positive baseline pressure continuously applied to the circuit and airway during both inspiration and expiration? 33. In this mode, the ventilator delivers a time-triggered breath and allows the patient to breathe at their own tidal volume between mechanical breaths? 34. In this mode, the ventilator delivers a set tidal volume or pressure at a time-triggered rate but the patient can trigger a mechanical breath above the pre-set rate? 35. In this mode of ventilation, the patient cannot trigger a mechanical or spontaneous breath so there is no negative deflection on graphics. The patient must be sedated or paralyzed. It is not as commonly used. 36. In order for this mode to be used, the patient must be spontaneously breathing, have adequate lung function to maintain normal PaCO2, and not be at risk for hypoventilation? 37. What does pressure support do? It augments spontaneous tidal volume, decreases spontaneous respiratory rate, and reduces the patient’s work of breathing. 38. How does pressure support decrease the patient’s spontaneous respiratory rate? An increased volume decreases the need for a high respiratory rate in order to achieve the required minute ventilation. Also, it decreases deadspace ventilation. 39. What is the desired respiratory rate? 40. What is tidal volume dependent upon with a pressure support mode? It’s dependent on the set inspiratory pressure, lung compliance, and airway resistance. 41. What makes flow variable in pressure support? It’s dependent upon the flow needed to maintain the plateau pressure. 42. What would be considered CPAP with pressure support? 43. CPAP with no pressure support would be considered? 44. How do you manage pressure support? Begin with 5 – 10 and increase in increments of 3 – 5. 45. You should titrate pressure support according to what 3 things? (1) Spontaneous tidal volume of 5 – 7 ml/kg of IBW. (2) Respiratory rate of less than 25. (3) A decrease in work of breathing. 46. Is PEEP considered a standalone mode on ventilation? 47. What are some effects of PEEP? They recruit alveoli, increase FRC (oxygenation), increase alveolar surface area (gas diffusion), increase compliance. 48. What are some complications of PEEP? Cardiac compromise, increased intrathoracic pressure, decreased venous return, decreased cardiac output and blood pressure. 49. What is an indication for PEEP? 50. How do you manage PEEP? 5 is the physiologic normal setting. Then you can increase in increments of 3 – 5 while also watching the patient’s blood pressure. You should decrease to the previous level or zero for to lower blood pressure. You can treat low blood pressure with volume expansion or vasopressors, then increase PEEP again while continuing to monitor. It is the volume change per unit of pressure. 52. Inverse ratio ventilation is? 53. During breathing, a long inspiration and a short expiration causes what? Air trapping, auto PEEP, and prevents alveolar collapse. Increased oxygenation, peep effects, increased FRC, PaO2, and surface area. 55. How does IRV prevent alveolar collapse? The critical opening pressure is reduced, the pressure needed for ventilation is less, and it improves ventilation. 56. What are some complications of IRV? Barotrauma, requires paralysis sedation, and cardiovascular compromise. 57. When is mandatory minute ventilation activated? When the patient’s spontaneous breathing is less than minimum set minute ventilation. When this occurs, the ventilator increases ventilation. 58. The method of increased ventilation with MMV varies upon what? The ventilator model (some increase respiratory rate, some tidal volume, and some pressure support). 59. What should the minute ventilation be set to achieve? 60. What are some advantages of MMV? It promotes spontaneous breathing, it requires minimal support but protects against hypoventilation and respiratory acidosis, and it permits weaning but compensates for apnea. 61. What are some disadvantages and complications of MMV? It doesn’t protect against deadspace breathing. A high respiratory rate with a low tidal volume means the patient is breathing above minute ventilation (MMV remains inactive but PaCO2 increases, respiratory acidosis). 62. What does pressure control generate? A flow in order to increase the airway pressure to a preset pressure limit. 63. When is inspiration terminated in Pressure Control? When the preset I-Time is reached. 64. What are some indications for pressure control? Low lung compliance, high PIP during volume ventilation, (PIP > 50, Pplat > 35), and ARDS. 65. What are some advantages of pressure control? PIP is reduced while maintaining adequate oxygenation and ventilation. Also, there is a reduced risk of barotraumas. 66. How do you manage pressure control? The PIP is set to achieve a desired tidal volume unless the patient is allowed to become hypercapnic in the interest of limiting PIP. Tidal volume and minute ventilation must be carefully monitored. A mode of ventilation that stands for: Airway Pressure Release Ventilation. 68. What happens during inspiration in APRV? Positive airway pressure augments spontaneous breathing (High CPAP level, reduces WOB, Increases MAP to increase O2, allows spontaneous inspiration at any point during the breath-elevated pressure delivery). 69. What happens during exhalation with APRV? Positive pressure is periodically released to allow exhalation (brief 1 – 2 seconds), decreases FRC and allows for exhalation and the release of CO2. 70. APRV is inappropriate for what kind of patients? Those at risk for an inadequate spontaneous respiratory rate. 71. APRV can resemble IRV when? The expiratory pressure release time is less than the spontaneous effort. 72. Why is APRV a beneficial alternative to IRV? Because it does not require paralytics. It is time-triggered but the patient is allowed to breathe spontaneously at any time; it is mandatory and spontaneous pressure limited; it is time-cycled d/t preset I-time. It reduces the risk of lung destruction by keeping alveoli open at a constant pressure, oscillates very rapidly (high respiratory rate at small volumes); early intervention is key. 75. How do you manage oxygenation with HFOV? Adjust the mean airway pressure, FiO2, and alveolar recruitment. 76. How do you manage ventilation with HFOV? Adjust the amplitude, Hertz, % I time, cuff deflation, and permissive hypercapnia. 77. What is Amplitude in HFOV? It is the change in stroke volume and the force delivered by the piston. 78. What are the trigger variables for VC/AC CMV? 79. What are the limit variables for VC/AC CMV? 80. What are the targeted variables for VC/AC CMV? 81. What are the cycle variables for VC/AC CMV? 82. What are the trigger variables for VC/SIMV? 83. What are the limit variables for VC/SIMV? 84. What is Controlled Mandatory Ventilation? It is used in sedated, apneic, or paralyzed patients. All breaths are triggered, limited, and cycled by the ventilator. The patient has no ability to initiate their own breaths. If a patient tries to take a breath while in the CMV mode it is reported to sound like sucking on an empty bottle. 85. What is Synchronized Intermittent Mandatory Ventilation? It is an assisted mechanical ventilation synchronized with the patients breathing. The ventilator senses the patient taking a breath then delivers the breath. Spontaneous breathing by patient occurs between the assisted mechanical breaths which occurs at preset intervals. If the patient fails to take a breath, the ventilator will provide a mechanical breath. 86. When is SIMV preferred? 87. How is SIMV is similar to CPAP and BIPAP? Because they are all spontaneously triggered by patient. 88. How does Assist Control Ventilation work? 89. What is the preferred mode for patients with respiratory distress? 90. What mode supports every breath whether its initiated by the patient or ventilator. Also, this mode delivers a full tidal volume regardless of the patient’s respiratory effort or drive? 91. This mode can be used in ARDS, paralyzed, or sedated patients? 92. During Assist-control ventilation, what can happen to an anxious patient? They can trigger the ventilator to hyperventilate which leads to breath stacking or auto-peep. 93. What does PSV stand for? 94. What mode can make it easier for the patient to overcome the resistance of the ET tube and is often used during weaning because it reduces the work of breathing? It supports ventilation during inspiration. The patient determines tidal volumes, rate, and minute volume. It requires consistent respiratory effort by the patient. 96. What is a component of CPAP/BPAP? They are both spontaneously triggered by the patient. 97. What does CPAP stand for? 98. What mode uses continuous positive pressure to maintain a continuous level of PEEP and uses mild air pressure to keep the airway open? 99. What does BiPAP stand for? 100. What mode uses alternating levels of peep to maintain oxygenation, commonly used in pneumonia, COPD, and asthma? So there you have! That wraps up our list of practice questions all about ventilator modes for mechanical ventilation. Study these and there’s no doubt you’ll make a higher percentage on your next exam on ventilator modes. And also, it will give you a head start on preparing for your board exams as well.